Heroes, Heroines, and History: Who is Ramona K. Cecil? Who is Ramona K. Cecil? Hi! I’m Ramona K. Cecil, and I’m thrilled to be part of the Christian Fiction Historical Society. So, you may ask, who is Ramona K. Cecil? First and foremost, I’m a Christian and a child of God. I’m also a wife, mother, grandmother, poet, and inspirational romance writer. Though a child of the “baby-boom” generation, mine was not the iconic suburban American childhood of the 1950s and early 1960’s. Instead, I enjoyed exploring the fields and wooded streams around our rural Indiana home. My mom was a homemaker and my dad worked at a diesel engine factory some thirty miles from our little five-acre “truck farm”. My chores included feeding the chickens, helping plant, weed, and harvest a large vegetable garden, rick (stack) firewood, and even drive a tractor. I grew up feeling very close to the Indiana soil. Creative writing was part of my birthright and came as easily to me as breathing. Both my parents were poets who had met in Indianapolis years earlier at a writers group called the Poets Corner. They encouraged me and my siblings, an older sister and younger brother, to read and appreciate the written word, but I was the one who got the “writing bug”. I remember my parents reading aloud to us, most often from the Bible and the poems of Hoosier poet, James Whitcomb Riley. In this fertile environment, my imagination and poetic tendencies emerged early and were encouraged. While swinging on the ever-present tree swing my dad would newly fashion for us kids each spring, I’d take in the bucolic scene around me. The rhythmic motion of the swing blended with my burgeoning appreciation of God’s handiwork and childish poems extolling nature’s beauty bubbled from me in four line rhyming verse. These, I learned from my mother, were poems. Since I hadn’t yet learned to write at the age of four, my mother jotted down the little ditties for me. Over the years, I composed literally hundreds of verses, most of which, whether for good or ill, have long been lost. Many hours of my childhood were spent nestled with a book in the sturdy branches of a favorite “climbing” tree. I discovered the stories of Hoosier author Gene Stratton Porter in whom, I found a kindred spirit. I simply devoured her books. Laddie was my favorite. That book still makes me both smile and weep. During my school years I became known for my poetry, some of which, won awards in national contests. Though I continued to write my “Helen Steiner-Rice style” verses after I married and became a young mother, I never considered my writing anything more than a hobby. Then after reading a poem at church one Sunday, I was invited by a gentleman in the audience whose job was to acquire verses for a Christian gift company to submit something to them. I did, and they accepted it. That began a decade-long association with the company; writing approximately ninety inspirational verses that appeared on all manner of gift items. People ask me how long it took for me to write my first book and I tell them “twenty-three years.” Whenever the muse struck and time allowed, I’d pound out a little more of the story on my old electric typewriter, then pitch the manuscript back into the drawer. I probably re-wrote the story three or four times over the years. In 1999 after both our two daughters left home and my husband and I became empty-nesters, I dragged out the raggedy manuscript. Deciding to “get serious” about my writing, I bought a computer and typed my story onto it. A desire to actually see my story in print began to grow in me. After revising the story yet again, I began writing more stories; another novel and three novellas. I knew I needed help. I couldn’t do this alone. Praying for God’s guidance, I Googled “Christian romance writers” and found the group American Christian Romance Writers, which later became American Christian Fiction Writers. There, I found the help I was searching for; critique groups, online writing classes, and willing hands and hearts eager to help me realize my dream. It took several years, a lot of hard work, sweat, and tears, but in 2005 my historical prairie romance story that I’d titled Larkspur, won the Vintage Romance Inspirations Contest and was published the next year by Vintage Romance Publishing. Two years later, my next three stories, Sweet Forever, Everlasting Promise, and Charity’s Heart were accepted and published by Barbour Publishing’s Heartsong Presents line. These three were re-released in 2010 as part of Barbour’s Romancing America series in a volume titled Freedom’s Crossroad. About this time, I was blessed to be accepted as a client by literary agent, Tamela Hancock Murray now of the Steve Laube Agency. With her professional help and guidance, two Christmas novellas with Barbour Publishing followed; To Hear Angels, part of A Woodland Christmas, and Simple Gifts, part of A Quaker Christmas. 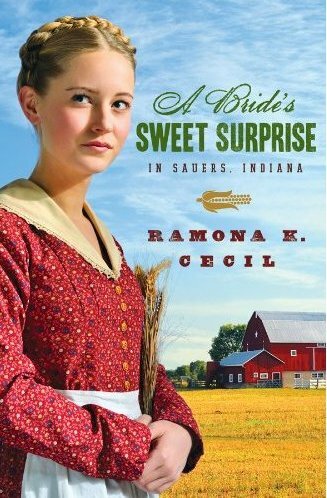 In March of 2012, Barbour Publishing released my first full-length story, A Bride’s Sweet Surprise in Sauers, Indiana. That story is scheduled for re-release July, 2013 in a volume titled Great Plains Brides where it will be coupled with another story in Barbour’s Brides/Wedding series by author Erica Vetsch. 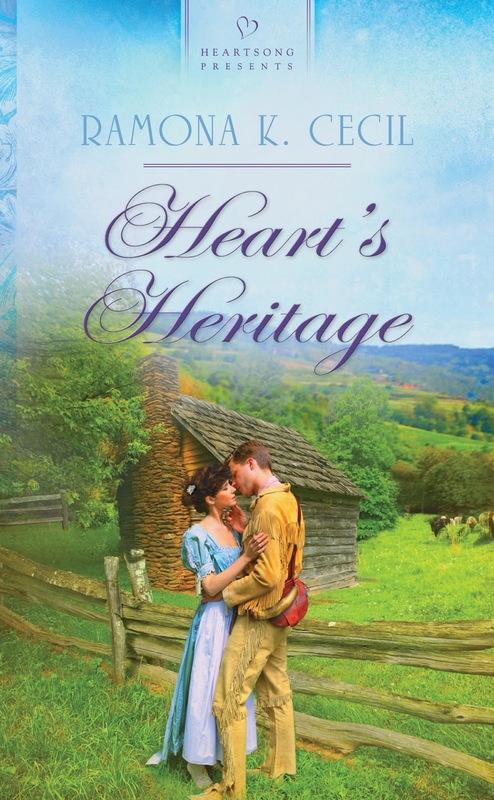 To date, my latest release is another Heartsong, Heart’s Heritage set, no surprise, in 1812 in Southern Indiana county. I will be giving away a copy of Heart’s Heritage as part of our group’s March giveaways that include a Kindle. I don’t know where my writing journey will take me, but I continue to write my stories that celebrate both romance and the history of Indiana, trusting God with the road ahead. You can read all about my books on my web site at www.ramonakcecil.com where I have links to their Amazon Books pages. Ramona, I loved reading more about you and your family. Such a beautiful voice. Hey Ramona, nice to get to know you. I've yet to read any of your books, but they sound good. I'll have to put them on my TBR list. God bless. Hi Romona, I have read your christmas Novellas. Have a feeling I have read or have one or two of your heartsong presents books too. Nice to get to know you more. Hi Jenny! I always love to meet one of my readers. I hope you get a chance to check out my two latest books, A Bride's Sweet Surprise in Sauers, Indiana and Heart's Heritage. Thanks, Christina. What a sweet compliment. Glad you enjoyed the blog. Hi, Debbie! Thanks for stopping by. I do hope you get to check out my books. Ramona! How fun to have poetic parents. No wonder you are a wordsmith. I loved the vision of your father hanging a new tree swing every year for your kids. What a wonderful picture of a great dad. Thanks for giving us a glimpse into another part of your life. Thanks, Debbie Lynne. I feel very blessed to have had the parents I did. I often get nostalgic for my childhood in the country. Ramona, it is wonderful to get to know you better through this post. I love that you started out as a poet. Authors with this background have a love for words and use them powerfully. I am hoping to get to read your work, especially your underground railroad story. I am also so inspired that your hard-working parents took the time to instill a love for literature in you and your siblings. That reminds me of my own mom. Growing up I remember she always had a book in her hands--usually a classic like War and Peace or Gone with the Wind or Anna Karenina . . .
Wishing you all the best on your upcoming projects. Lord bless! 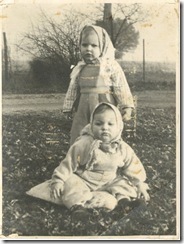 Ramona, I grew up on a small farm in Indiana and shared similar experiences to yours. When I visit Indiana, I love to go to the Gene Stratton Porter house and the Loblolly marsh. Thank you for sharing with us. Hi Nancy! I'm always thrilled to meet another Hoosier writer! Doesn't matter where you live now, once a Hoosier, always a Hoosier. LOL I have fond memories of visiting the Gene Stratton Porter home. That's where I got several of my books by her. Thanks for sharing about your past and the fun picture of when you were young. I've seen pictures of the Conner Prairie museum and would love to visit it some day. Thanks, Vickie! I think you'd love Conner Prairie. If you ever get to visit, plan to spend the day. There's a lot to see and do. The larger part replicates Indiana of 1835, but they also now have a section that replicates the Indiana prairie during the 1860's Civil War era. Hi, Ramona. It sounds like we had similar childhoods, although yours was a little more rural than mine. Thanks for the trip down memory lane. Hi, Ramona, thanks for reminding me of tree swings. The sensation of touching the branches and leaves with my bare toes is still very vivid. What a blessing to grow up in a time when we could be kids, daydream, and plot adventures. :) I discovered this wicked sweet blog at midnight yesterday! Ever since, I have been attempting to leave a note to each author as I read through all your lovely introduction posts! I can tell this is going to be a blog I will enjoy visiting weekly, as I am already an RSS feed subscriber! I have a flip calendar full of Helen Steiner Rice poems and quotations! I can attest that her kind of poetry strikes a chord inside me,... always laying a moment to bemuse what she is expressing and to ponder the deeper meanings behind her verses! I wonder if you have published your poetry!? I am only halfway through your post! :) Laughs.